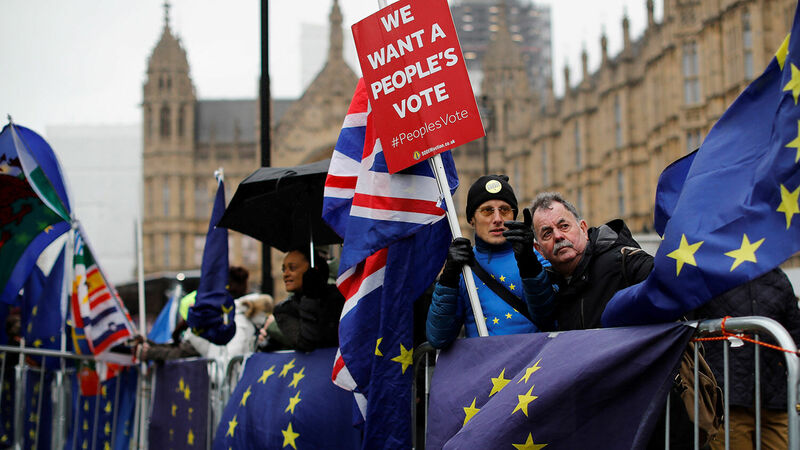 Anti-Brexit activists call for a “people’s vote” as they demonstrate outside the Houses of Parliament in central London on January 16. The British Parliament has voted. British Prime Minster Theresa May’s fear has come true: The House of Commons rejected her proposed Withdrawal Agreement yesterday, 432 against 202. May already knew the outcome of this vote in December. Seeing that Parliament would not support the terms of the deal she had negotiated with the European Union in November, she toured Europe pleading for changes to some of the terms of the deal. But to no avail. Now her proposal has been defeated with no hope for a better deal from Europe’s bureaucrats and heads of government. One way or another, Britain must leave the EU by March 24, or ask for more time. Britain is now at the mercy of the EU. Whoever will lead Britain in the future will have little time to plead for better terms, with little hope of success, or leave without a deal at all. Britain stands alone against 27 other nations. Its “aloneness” was prophesied with vivid imagery in the Bible. Britain joined the European Economic Community, which later became the EU, in hopes of sharing in the Union’s economic benefits. Britain also hoped to prevent the Union from being dominated by Germany. However, Britain had purchased for itself a front-row seat as the Union slowly morphed into a German-led empire in which countries have lost their say and sovereignty. Britain had hoped it could prevent such a metamorphosis from happening, but it too fell victim to the German design. Prior to the EU’s Brexit summit in 2017, German Chancellor Angela Merkel warned Britain about its “illusions” concerning the Brexit deal. She said that a nonmember state cannot have more benefits than the member states. Knowing the deal would be rejected back home, Prime Minister May toured Europe in December, seeking improvements. She found none. Though the vote disappointed EU leaders, they again put the pressure on the British government. Since Britain has rejected the EU’s proposed terms, EU leaders are asking British leaders for a clear answer of what they want. But the country is so divided, its leaders don’t agree on anything. Of course, Germany, the leading force of Europe, would have loved for Britain to just conform and submit to the growing German dictatorship. But that did not happen. Britain opposed the German decrees in the EU, hindered the creation of a common EU army, refused to gradually surrender its sovereignty, and served as a counterbalance to the German diktat. As a “lone donkey,” Britain today is pleading for help, baying at Germany’s door. The two will come to some form of an agreement, but it will hardly be in Britain’s favor. In The United States and Britain in Prophecy, Mr. Armstrong quoted these verses and then noted that Britain indeed has heard this message “from the World Tomorrow broadcast warning!” Mr. Armstrong sounded the alarm on his weekly television program and through other publications. He warned Britain of its sins and told it where it was heading if it would not repent and turn to God. Today, January 16, is the 33rd anniversary of Mr. Armstrong’s death, but his warning continues to this day. Trumpet editor in chief Gerald Flurry just completed a new booklet, January 16: God’s Miracle Day. This booklet explains why so many major events happen around the anniversary of Mr. Armstrong’s death, and how his warning continues to be trumpeted today.